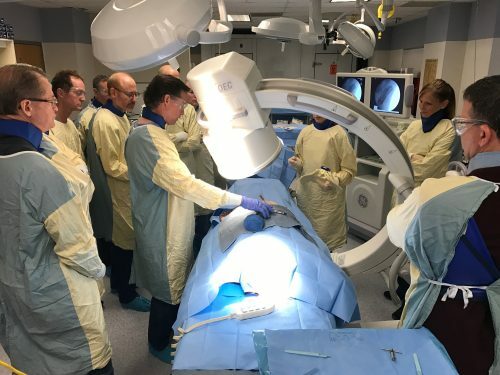 Isto Biologics’ Medical Education team recently supported a cadaver lab led by Dr. Blake Johnson, Medical Director at CDI – Twin Cities MN, to educate his colleagues on bone marrow aspiration techniques, autologous therapy and the benefits of using the Magellan® system. Based on his experience using the Magellan Autologous Separation System, Dr. Johnson has been pleased with his patients’ results. Dr. Johnson hosted a hands-on teaching course, utilizing a C-arm in a cadaver lab setting, to train his peers on marrow aspiration and enable them to be more comfortable aspirating bone marrow. The course also provided an opportunity for physicians to better understand regenerative medicine and how the Magellan technology may benefit their practice. Isto’s Medical Education team was on hand to demonstrate the Magellan system and practical application of Isto Biologics products, including the proprietary Lightning Aspiration Needle. Dr. Johnson of Minneapolis, MN, is the Twin Cities Medical Director at CDI where he focuses on spine pain management. He is an international and national lecturer. The Magellan is an automated concentration system with flexibility to process both bone marrow and whole blood, providing high concentrations of platelets and cells in low final output volumes.